The Twitterverse exploded yesterday with an update to the ‘favourite’ icon. Where there has always been a gold star, with the words “you favourited this” or “@soandso favourited this”, suddenly there was a red heart. A glaringly red heart, like a gaping wound carved into the blue skin of Twitter. I’m mourning the loss of the gold star and all that its presence in my Twitter world represented. I’ll start by explaining how I used the Twitter gold star. It was a thank you for a comment or share. It was a log of conversations and comments to which I wanted to return. It was a like. “Good share / nice post /effective point,” usually followed by a retweet. But it wasn’t just a like. As well as being reminiscent of award stickers from school days, the gold star, in conjunction with its description as a ‘favourite’, was a nuanced symbol of Twitter communication. And now it’s been replaced with a glib red heart. Superficial. Facile. Flippant. Lacking in nuance. These strings of blood-red hearts in my feed make me feel like I must be in some kind of sappy, thoughtless feeling-saturated love-in. I don’t mind giving a bit of heart love while watching a Periscope broadcast. I don’t mind the practice of likes on Facebook and Instagram. In these worlds, a user can ‘like’ something in a transient way, and then forget about it. Click. Forget. Liking works for me because on Facebook I’m engaging about my non-work non-academic life. On Twitter I’m often engaging in discussion on education, research, politics, parenting or work. As a point of difference, Twitter gives us a record of those things we’ve favourited (or now, ‘liked’) meaning that the star/heart favourite/like is a way of curating a feed of personalised information. This is a good thing. The change in language is a change in purpose. ‘Liking’ a post is different to ‘favouriting’ it. Do I want to *star* a confronting article, an opposing viewpoint or a harrowing news story? Maybe. Would I want to *heart* it? No. Twitter says the star was confusing to newcomers. It was versatile. Twitter says the heart is more expressive. It is less expressive and more one-dimensional. Twitter says the heart is a universal cross-cultural symbol. Yes. Of love. Twitter isn’t about love for all its users. I don’t follow celebrities, unless you count edu-gurus and academic-crushes. So I don’t want to dole out ‘likes’ or ‘hearts’. Those of us who use Twitter as a professional and intellectual tool have been left without one of our favourite aspects of that tool; the ability to keep a log of those things which interest, intrigue or provoke us, without necessarily ‘liking’ them. To some, Twitter’s new attempt to engage and build its user base might be a simple change of shape and colour, but shapes and colours carry meanings. A gold star is a symbol of quality. A red heart is a symbol of emotion. I love Twitter but want to engage with ideas in that space, not spew out feelings. 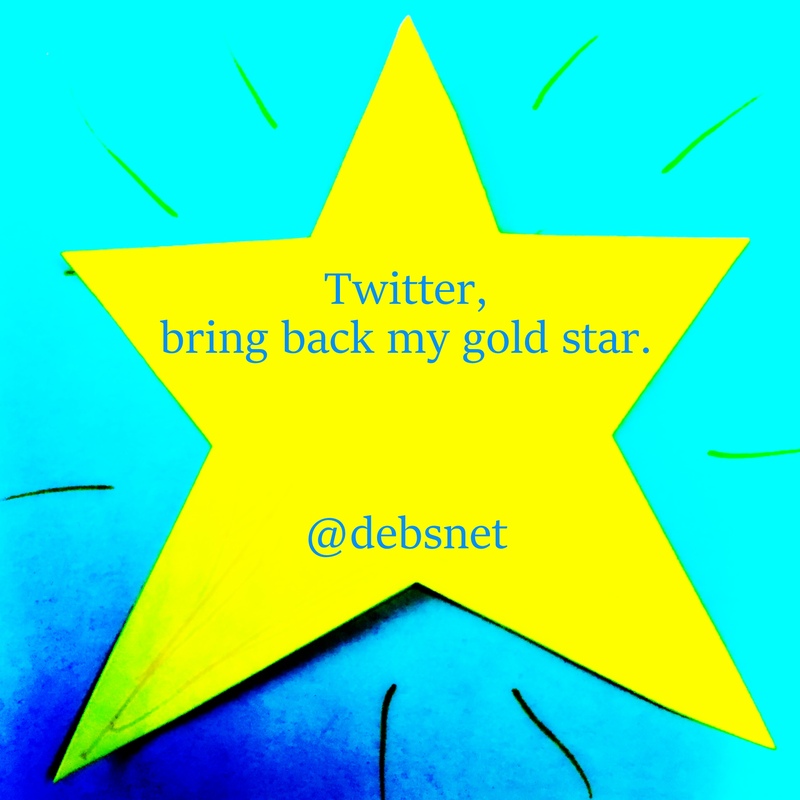 Bring back my gold star. This entry was posted in Social Media and tagged #TwitterHeart, Facebook, social media, twitter, Twitter heart by Dr Deborah M. Netolicky. Bookmark the permalink. It’s such a misguided change. In one stroke of an emoji key, Twitter has removed all the nuances we love and replaced it with a bland alternative. I can only hope they come to their senses, much like when they thought it was a great idea to allow for long tweets. I’ve said it before and I’ll say it again, don’t mess with the poetry of Twitter. Hoorah for the un-besmirched poetry of Twitter, Sarah! This move is such a shame for the dedicated user, and I don’t think it’s going to incite a new, cool, heart-happy crowd to join the Twitterverse. While Twitter is arguing that the heart is a versatile symbol, you’re right: it’s bland. It’s dumbing down and tarting up. Maybe, but trying to make itself more like other social media makes isn’t going to help Twitter be its own beast. I suspect that those who use Twitter purposefully will share your dismay Deb; few would argue that the switch has imposed restrictions on their behaviour. Perhaps however, the heart provides a clearer sense of intent? As you mention, people used the favourite in a variety of different ways. From a favouriter perspective, this is fine, because they know why they favourited a particular tweet. From the recipient’s end though, there’s the potential for ambiguity – why did they favourite that tweet?